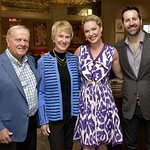 Emmy Award-winning actress Katherine Heigl has announced her newest venture, Just One, which features a line of specially designed pet products. A portion of each sale will support animal welfare efforts and programs. Just One will begin by selling a line of custom-designed dog and cat collars through Amazon.com and www.just1pet.com. More retailers and product lines will be added in the coming weeks. Just One was established to help fund the worthy efforts of the Jason Debus Heigl Foundation. Just One sells pet products with the Just One name in order to spread awareness of the global problem of animal cruelty. And it donates a portion of each sale to end that cruelty. Just One person can make a difference. For more information please visit just1pet.com. The Jason Debus Heigl Foundation was founded by Nancy and Katherine Heigl in loving memory of their son and brother, Jason, who passed away at the age of 15. Jason loved animals. The Foundation extends his legacy of compassion and care by funding eorts to end the euthanizing of 10,000 pets a day and improving their lives through a variety of programs, from funding spay/neuter surgeries to assisting rescue organizations. For more information please visit jasonheiglfoundation.org.